Ornamental crabapple trees (Malus) range from 10 to 25 feet in height with a spread from 15 to 25 feet. Spring flowers are abundant and often quite fragrant. Flower colors are pink, purple, red and white. The trees produce small, edible fruits. More than 1,000 varieties of crabapple trees flourish around the world, according to the University of Colorado. The crabapple's average lifespan is between 30 and 40 years. From April to May, the crabapple tree produces an abundance of blossoms adored by bees. Flowers appear single, double, and semi-double. The trees flower over a one- to two-week span. The flowers appear as colorful balloon-type buds that burst into flowers. The buds are often a more brilliant color then the blossoms, which appear softer or even white. Crabapple fruit ranges from 1/4 inch to 2 inches in diameter. Fruit colors appear yellow, orange, red and purple, depending on the crabapple tree variety. Fruit often drops from the tree ripe or will persist into the winter. Harvested fruit is popular in jams and jellies. Birds and other small mammals enjoy the tree's fruit. Crabapples produce an abundance of bright green foliage. 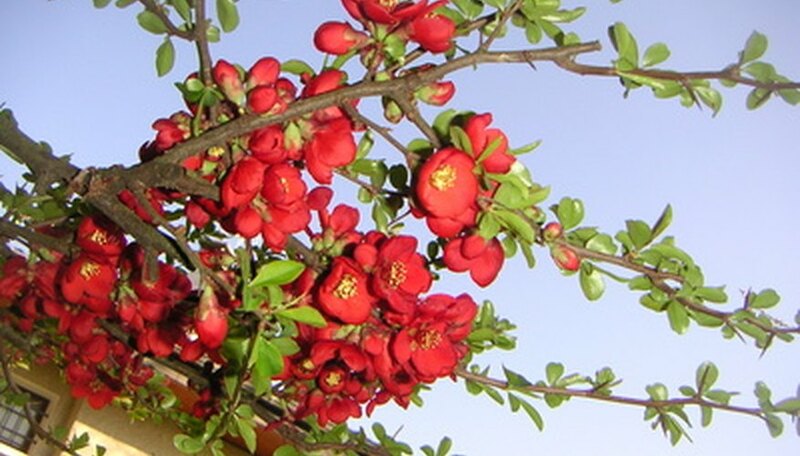 Early in the spring season, a few varieties produce foliage that appears red or bronze and then gradually changes to green. Numerous varieties offer leaves that are predominately green but tipped or outlined in red. Many crabapple varieties sport a stunning fall foliage display. Colors appear yellow, orange, rust and red. The crabapple tree easily produces suckers from its root stock. Suckers allowed to grow will rapidly turn the crabapple into a multi-stemmed tree. The sucker growth often produces flowers and fruits in different shades then the parent tree. On cultivars, the root stock of the tree is different from the tree itself, so excessive sucker growth of the root stock will eventually take over the parent tree and limit or cease its growing ability. The crabapple will quickly morph into the tree of the root stock and cease being the grafted tree top. The crabapple tree is considered a long-living deciduous fruit tree. Trees that live past 40 years begin to show a decline in flowering, fruit production and new growth. A few crabapples have been noted to live up to 70 years.